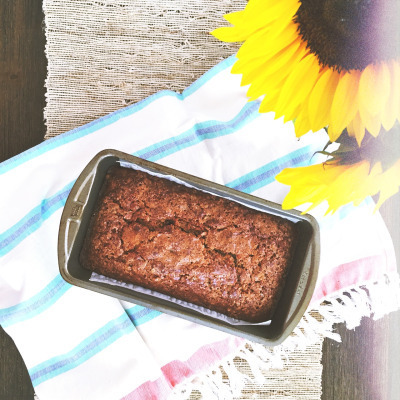 Maple Olive-oil Banana Bread – A Healthy Pinch. So…where to start? 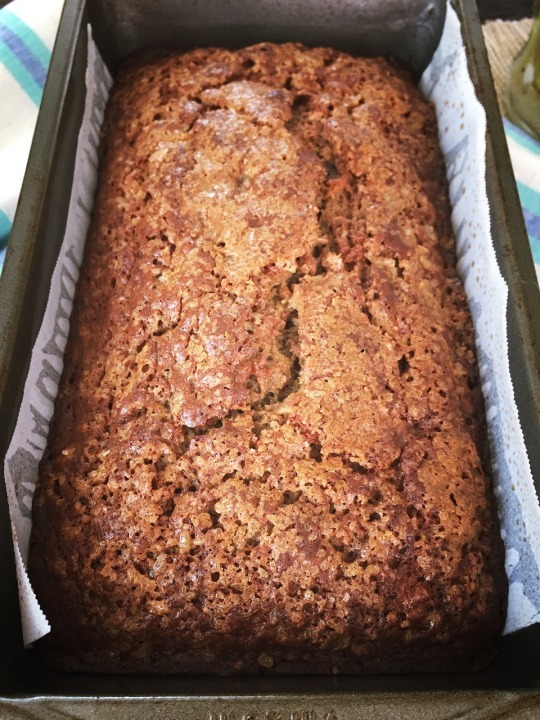 I’ll start by telling you how much I adore this banana bread! It’s been my go-to recipe for a few years now and I dare not deviate from it. As much as I love bananas, I love this bread even more. So much so that I could probably make it from memory. It contains all the glutens, since I use whole wheat flour, however olive oil is used as the fat and Greek yogurt keeps the bread moist. Maple syrup (100%) is then combined with dark muscovado sugar to give this quick-bread wonderful caramel notes. Finally, the top is crusted with Bourbon Vanilla-Bean sugar to give it some crunch; my absolute favorite part. Try keeping this in your house more than a day or two…I guarantee it can’t be done! Preheat oven to 350F. Spray an 8 x 4 inch loaf pan with coconut oil. Line pan with a sling of parchment paper, with the long sides overhanging. Lightly spray the parchment, then set the pan aside. In a large bowl, whisk together the olive oil and brown sugar, breaking up any lumps. Add the maple syrup and vanilla, whisking until smooth. Add the eggs, one at a time and beat until fully incorporated. With a wooden spoon, stir in the bananas, then Greek yogurt. Add the flour mixture to the liquids, stirring until just combined. Do not over mix. Pour batter into prepared pan, evening out the top if necessary. Mix together the turbinado sugar and cinnamon. Sprinkle the topping liberally over the batter and baked until a cake tester inserted in the middle of the loaf comes out clean, about 60-70 minutes. Remove from the oven, and leave the bread to cool in its pan for 10 minutes. Using the parchment sling, lift the bread out of the pan, unwrap and allow to cool completely on a wire rack. We had family surprise us with a visit this week and I was lucky enough to make this with my niece who has really started to enjoy cooking and baking. Not only did she help with this batch, she was my recipe tester for the past couple days and gave this bread a big thumbs-up! Hope you do too!